sandyrunhuntco | Sandy Run Hunt Co.
Steve Henna set up a hunt for his son, Nathan, son in law, Mitch Ashbaugh and friend Steve Knebel. They started late on a December afternoon, giving time for every one to get in town for the holidays and the hunt. Colton Wilkins took out his shorthair, Preacher, to find the pheasant, chukar and quail in the Clubhouse Field. The hunt may not have been called on the account of darkness but it was close. This entry was posted in Upland Hunting Videos on April 4, 2019 by sandyrunhuntco. Mike Fitzatrick and Jonathon Bracken came out for a Christmas Eve pheasant and chukar hunt. I stocked the Clubhouse Field and then got out Sol and Ava to find the birds in the prairie. Some nice rises on roosters and chukar doubles followed by some good shooting. Even found a spare chukar and quail. Nice way to usher in the holidays. This entry was posted in Upland Hunting Videos on March 30, 2019 by sandyrunhuntco. Tom Duddy came out with his friend, Anthony Calarco and his shorthair, Bodie to hunt some quail. The day they had available was cloudy, windy and wet, but they still had a nice hunt in the prairie on the South Tinkerfarm Field. I was able to get one covey rise on camera, nice dog work and shooting. Dan Butler set up a mega upland bird hunt day for his buddies, Mike Severe, Gary Morgan, Joe Hodge, Jim Matusin, and Tyler Morgan. Dan does it right, going after over 140 birds over two hunts on a beautiful, December, Saturday. Jeff Powell did the guiding for the morning hunt in the Cabin Field. After some lunch, Travis Devall took them back to the Cabin Field after some more birds and clean up some from the morning. Some incredible big covey rises in this video. This entry was posted in Upland Hunting Videos on March 29, 2019 by sandyrunhuntco. Caroline and Mark Gilje brought out their Pudelpointer, Wendy to hunt some quail with their friends, Bill McKay, Tom Truss and Michael Murphy. But before that big hunt, Caroline and Michael came out a couple days before on a wet, windy afternoon to get Wendy on some birds. Two days after that warm up hunt, they came back to hunt some quail coveys in the Cabin Field, Some nice covey rises and lots of shooting with the big group. The Central Prairie Field Trial Club held the Jimmy Dale McNutt Amateur Shooting Dog Trial Saturday, March 23 at the Sandy Run Cabin Field. Beautiful day for a full field of setters and pointers, 8 braces for the shooting dog trial, but not many made it around the course clean. 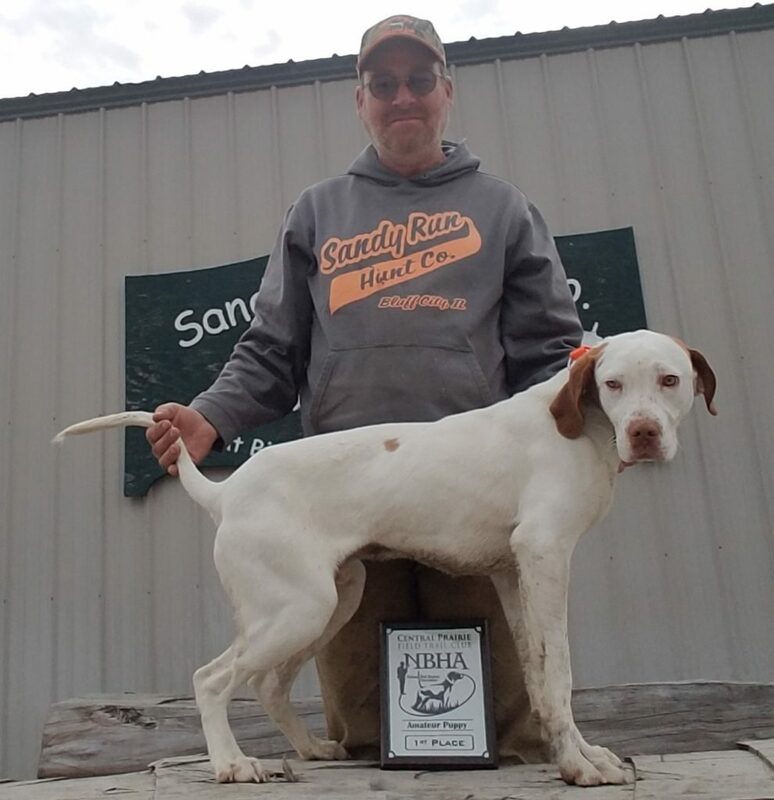 Jeff Hainline’s female pointer, Star, placed first with ZuZu, Randy Zimmer’s setter coming in second and Doc, handled by Butch Spelbring getting the third placement. Patch, Frank Chirstie’s pointer won the Derby, with another Patch, run by Jeremiah Seifert, getting the second placement and Brad Hargis’s pointer, Rebel coming in third. Ron Hamp’s setter, Bob, took the first placement in the Gun dog trial. Sammie, a setter male, handled by Gary Matevey got second and Sam, Brad Hargis’s pointer female, came in third. Big Mack, Jeff Marshall’s male pointer, won the puppy trial. He ran the course much better than he poses. 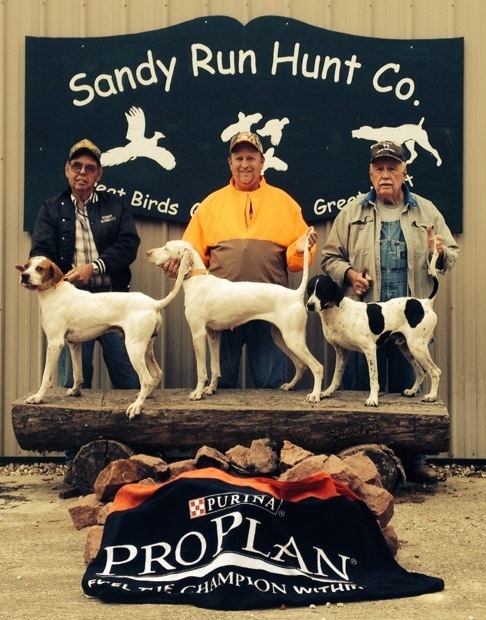 Dale Smith collected the second and third placements with his pointer pups, Lilly and Hank. This entry was posted in Upland Hunting Videos on March 27, 2019 by sandyrunhuntco. The Central Prairie Field Trial Club will be holding its spring trial here in the Sandy Run Hunt Co. fields on Saturday March 23, 2019. If you have a good hunting dog, you should consider entering in the Amateur Gun Dog Trial. The dogs in this trial run the course with another dog, need to be able to find birds, back dogs on point and hold their point until the bird flushes. Sounds like your dog can do that easy enough, bring him out, maybe you will get one of mine in a brace. If you are looking for hunting dogs and puppies, you can make some contacts with some folks who know where there are some of the nicest hunting dogs for sale or on the way. Plus the trials give anyone a chance to see some classy looking dogs in action. Bring your horse, ATV or walking shoes to be part of the gallery. This entry was posted in Upland Hunting Videos on February 28, 2019 by sandyrunhuntco. 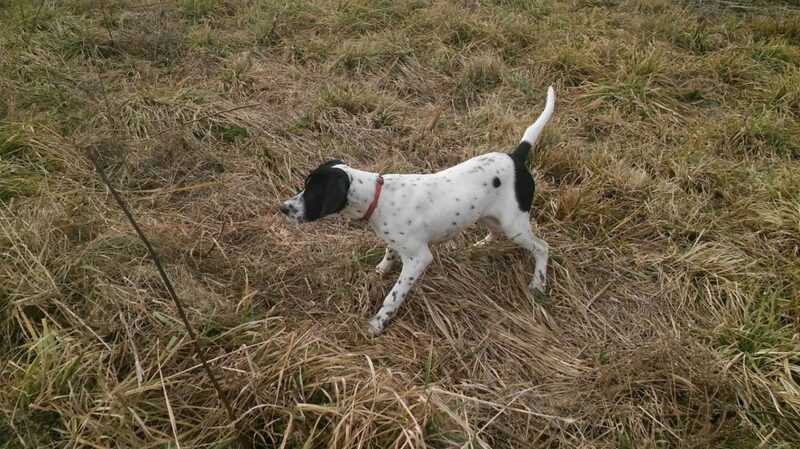 Preacher is a German Shorthair, used to guide by Colton Wilkins. 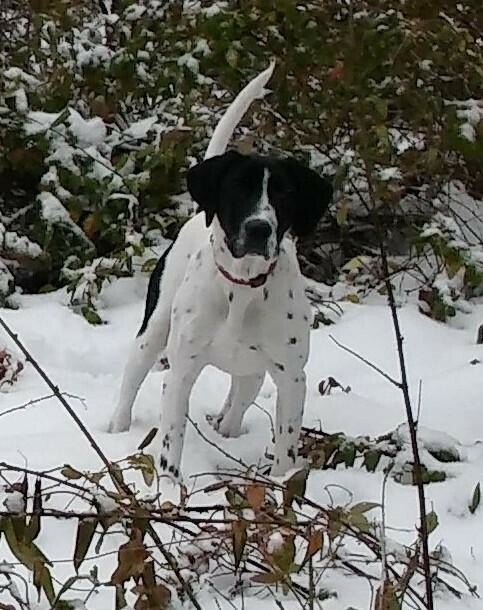 Last fall Preacher sired a litter with Jay Garrett’s English Setter, Roxy. Both parents are good bird finders and excellent hunters. Spike is one of the litter that is now about 6 months and ready to find a new hunting home. Spike has had some training, had birds shot over him and he loves to retrieve. Please contact Jar Garrett at 618 339-2298.